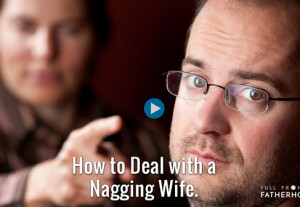 Wife nagging you? Micromanaging your every parenting move? It makes for a lousy home life and it usually means the woman isn’t happy either. This week’s video gives men 4 steps to stop the nagging and create a balanced family where everyone is happier. And of course this applies when it’s the woman or a gay partner who is feeling nagged. Do you feel like second class citizens in your own home? So often as men we feel disempowered and controlled by our partners. We don’t feel like an equal partner, but rather some lesser parent that is constantly nagged and told what to do. It is a horrible experience to feel this in our own homes. It makes family life really unpleasant and often leads us to turn our attention towards work or sports or anywhere where we can feel good. If you are feeling walked on by your partner, here are four things that you can do to create that balance and come to create a really good home life for you and your whole family. Talk to your partner about it. She is probably unaware what is happening for you. She probably has her own disappointments and is caught up in her own suffering. Create the space to tell her how you’re feeling like a second class parent, how you’re feeling unheard and just being controlled like a child. If you can share that you want to create a functioning team where both of you are equally empowered, this will help her to realize what she is doing and how to support you. Many women do not realize their men want to be more involved or how they are disempowering their parterns. She can watch 1 Key to Being a Great Mom for more information about this. You also need to realize how you can change the team by stepping up, and I will get to that in a moment. Give her space to talk about what is happening for her. If she is expressing a lot of disappointments in an indirect, nagging and controlling way, then obviously she is not satisfied and needs a place to constructively express her dissatisfaction and have those disappointments attended to in a healthy way. Ask her what is going on for her. Find out what’s happening in her experience and how she feels about you as a partner. Give her the space to really talk about what she needs and what is not working for her. A significant amount of the tension is released simply through both of you sharing what is working and what is not working. Then you can move to make steps to create a well functioning team. So often men take nagging from their partner’s lying down and just get silently resentful. When your partner’s stepping in to control you or micro-manage you, remind her that you got it. She is biologically wired to get in there and control the whole home. Her body is saying, “I need to make this safe for my family and to make sure that my man is providing in the best way for my baby.” If you are on the receiving end of that, it’s horrible. Gently say to your partner, “I got this. It is okay. Yeah, I may fumble with this, but let me do it.” It reminds her to control her strong impulses to micro-manage the situation and gives you space to find your own way. In time she will increasingly trust that she can let go and let you handle it. If you are standing back in your family and allowing the woman to do more of what is needed, then of course she is going to be disappointed and overwhelmed. She is going to express this to you in all kinds of passive aggressive, uncomfortable ways. If you are hiding behind your work or newspaper and not really taking care of the family, then you are not carrying your weight and it’s going to lead to a very imbalanced situation where she is left with nothing but nagging you to try to change the situation. Obviously, that doesn’t work. Find out what’s stopping you from being an equally engaged member of the family. You can watch my videos, Why Modern Families Struggle and One Key To Being A Great Dad and explore what’s happening for you that is preventing you from really getting in there. Do you feel some self-doubt about being an equal parent? Do you feel like your wife is better equipped to provide for the kids and so it’s easier to hide from the chaos behind your phone? Face whatever you are avoiding so that you can be an equal, engaged member in those moments. It is not just about being a “good” husband for your family’s sake. In my experience, nothing in life is more satisfying than actively fathering one’s kids, but you have to find your way to realize your potential as an awesome Dad. If you are getting walked on in your relationship, use these four things to re-balance it. 1. Talk to your partner about what is going on for you. 2. Give her space to really hear about what is going on for her. 3. Assert yourself when she is introducing a new idea about how you should do something. 4. Step up to be an equal parent. If you use these things you can create a family that thrives and is far more enjoyable for everybody. I’d love to hear your ideas about how to prevent yourself from getting walked on. Please join the conversation below and I’ll see you next time for another episode. Watch more DIY videos at Full Frontal Fatherhood.